Did anyone else out there start the day with a piece of pumpkin pie? I know I can’t be the only one. Pumpkin pie almost always tastes better the morning after Thanksgiving; I’m not sure if it’s because the cloves and cinnamon have had a chance to meld into the pumpkin custard, or because things just taste better when you’re not stuffed to the point of pain. Either way, I like it for breakfast with a blob of barely sweetened whipped cream and a giant cup of black coffee. Since I’m a little cooked out today, instead of posting pumpkin pie recipes I thought I’d share my favorite way to make coffee. This is a great method if you like your coffee HOT, freshly brewed (vs scorched from a burner) and freshly roasted (vs pods) – like I do. (It should be noted that I have been called a “coffee snob” on more than one occasion, and I’m OK with that.) 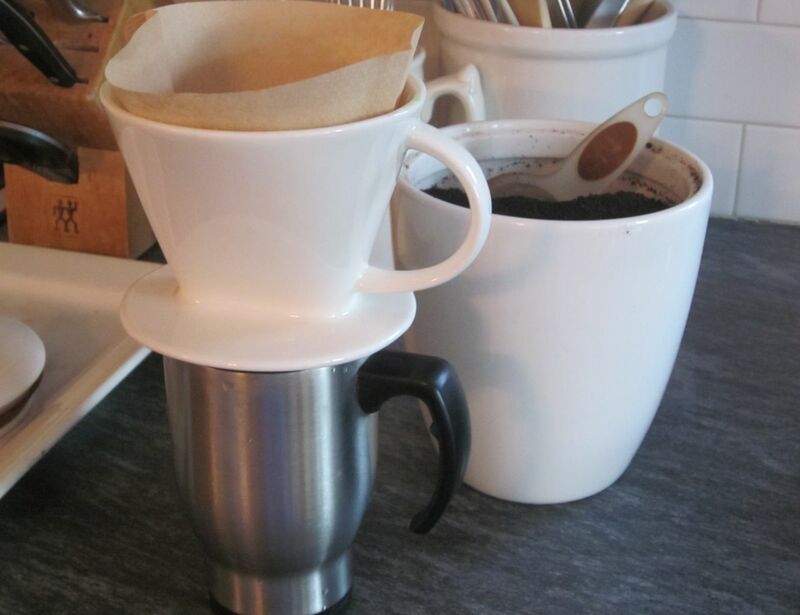 I started making my morning coffee this way when my old coffeemaker died, and even though I have a new machine now, I prefer this method when making coffee for one. Freshly roasted coffee, ground for “paper cone” if you have a coffee place grind it for you. I like dark roasts like French Roast. 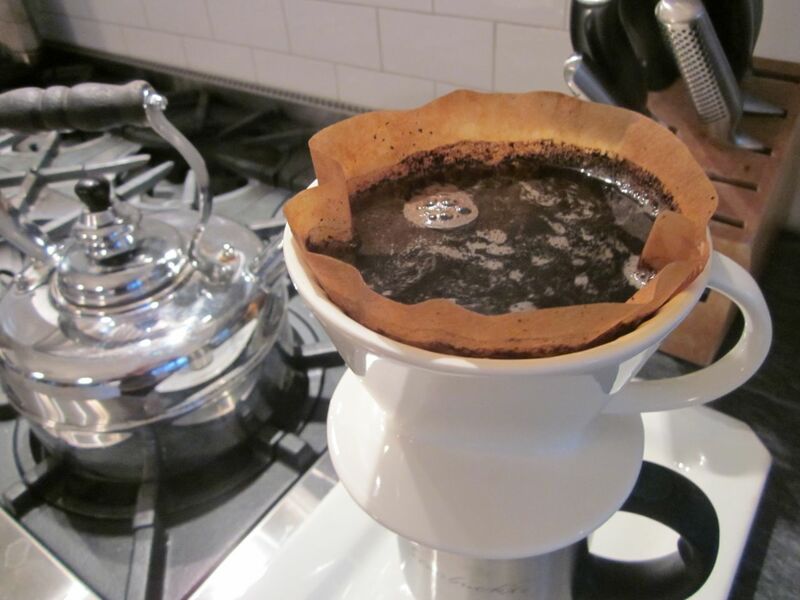 When the water reaches boiling, pour it into filter holder with coffee grounds, filling to the top. (Note: I do this over a small tray since sometimes I overpour and end up with a coffee puddle.) When all water has drained through the filter, the coffee’s ready to drink. Legal disclaimer: Coffee will be very hot! Unless you have an asbestos mouth, have some pie while the coffee cools. 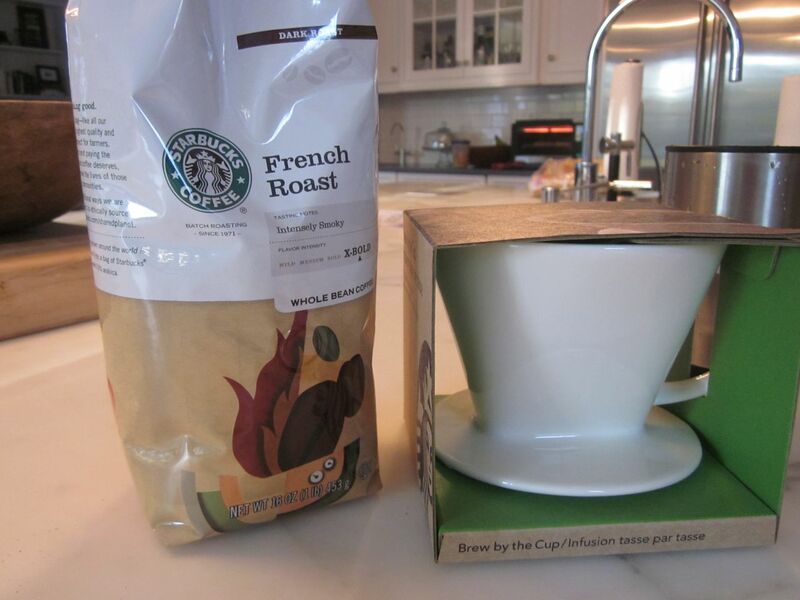 This entry was posted in Coffee and tagged brewing coffee, coffee by subeeskitchen. Bookmark the permalink.